Metazoan organisms are comprised of myriad specialized cell types that perform key physiological functions, including cardiovascular and metabolic homeostasis. As all cells in an organism generally share the same genome, the development and maintenance of these specialized cells (i.e. "cell state") is ultimately orchestrated by tight spatio-temporal control of gene expression. An overarching goal of our laboratory's research is to gain deep understanding of how transcription factors and epigenetically-active macromolecules signal in the context of chromatin to control gene expression programs in physiology and disease. 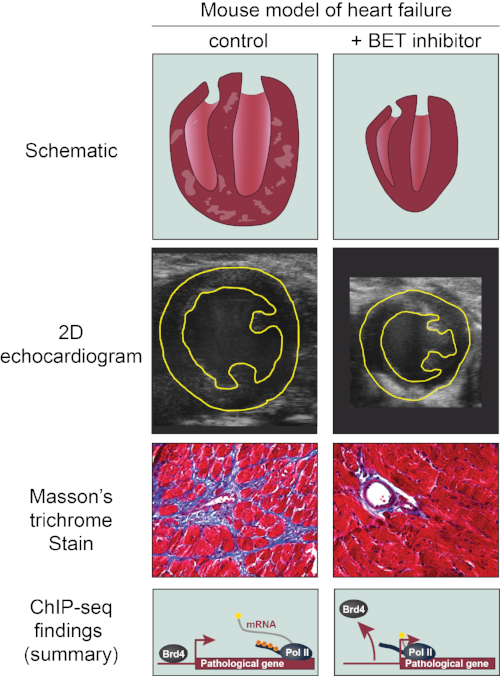 We are particularly interested in understanding the molecular pathogenesis of cardiovascular (e.g. heart failure) and metabolic diseases (e.g. obesity and diabetes), and hope that this insight can elucidate novel therapeutic strategies for these lethal conditions which have reached epidemic proportions in our society. It may be intuitive to think of human developmental disorders or cancers as conditions of aberrant cell identity. For example, when differentiating cells fail to properly express key gene programs during critical developmental windows, organ malformation and developmental defects occur. Likewise, in cancer, previously normal cells accumulate DNA mutations that drive aberrant gene expression programs, ultimately creating a cell state capable of unbridled growth and dissemination. A central hypothesis in our laboratory is that diseases such as heart failure, like cancer, are fundamentally driven by abnormalities in cell identity, which in turn are rooted in aberrant gene control mechanisms. Our broader vision is to gain a deep understanding of these gene control mechanisms in order to discover novel therapeutic and regenerative approaches for common and lethal diseases such as heart failure. Study of these gene regulatory and chromatin-dependent signaling pathways range from in vitro to in vivo approaches, utilize genetic manipulation of cells and model organisms (e.g. CRISPR-Cas based genome editing), and leverage genome-wide analyses, chemical biology, high throughput screening, and human biology/genetics. In addition to our discovery-based and mechanistic work, our studies using small molecule inhibitors in heart failure have been patented and are in active pre-clinical development. A major focus of our team is in the pathobiology of heart failure, a devastating disease for which morbidity and mortality remain extremely high despite current standards of medical care. One of the laboratory's central goals is to discover novel mechanisms underlying heart failure pathogenesis and to develop new therapeutic strategies for this extremely common and lethal condition. We have a deep interest in the very nascent area of cardiovascular epigenetics and seek to unravel how chromatin-dependent signal transduction drives cardiovascular plasticity during physiological and pathophysiological states. As epigenetic regulators and chromatin-associated proteins are often tractable drug targets, we actively seek to translate our findings into novel transcriptionally-active cardiovascular therapeutics. A key discovery from our laboratory is that BRD4, a member of the BET family (bromodomain and extra-terminal) acetyl-lysine "reader" proteins, is an essential effector of heart failure pathogenesis that can be pharmacologically targeted in vivo (Anand et. al, Cell 2013). Using ChIP-seq and RNA-seq in the heart, we have demonstrated that BRD4 is dynamically recruited to subsets of active cardiac enhancers and signals downstream to RNA Polymerase II to trigger productive elongation of disease causing genes (see figure below). Inhibition of BET bromodomain protein function with JQ1, a first-in-class, potent, specific and reversible small molecule, has dramatic therapeutic effects in animal models of heart failure. In addition to next-phase translational studies of BET bormodomain inhibition, our laboratory seeks to unravel precise molecular mechanisms by which BET bromodomain proteins signal in the cardiovascular system. In addition, we are screening for novel epigenetic regulators that are involved in heart failure pathogenesis and may be druggable targets, efforts which have already begun to bear exciting results. Click the link below to hear Gladstone Investigator Saptarsi Haldar interview with National Public Radio (NPR) about novel targets for heart failure. BRD4 regulates transcriptional pause-release of RNA Pol II during heart failure pathogenesis. BRD4 inhibition using the first-in-class, potent and specific inhibitor JQ1 blocks pathologic transcriptional anabolism and heart failure pathogenesis in vivo (Anand et al., Cell 2013). Mammals have a remarkable capacity to adapt to changes in nutrient supply (e.g. starvation) and energy demand (e.g. exercise). Importantly, it is these fundamental adaptive processes that become deranged in diseases such as diabetes, obesity, atherosclerosis, heart failure and skeletal myopathies. This robust metabolic plasticity is, in a large part, governed at the level of chromatin signaling across several organs in an integrated manner. A major focus of our laboratory is to unravel the molecular mechanisms that underlie these integrated metabolic responses, with an ultimate goal of therapeutically manipulating these pathways in metabolic and myopathic disease. Over the last decade, studies by our group and others have elucidated novel roles for the KLF (Kruppel-Like Factor) family of zinc finger DNA-binding proteins as critical regulators of cardiovascular plasticity and multi-organ metabolic homeostasis. This work demonstrates that KLF15 regulates coordinated gene programs across several organs that are essential for adaptation to fasting, starvation, and endurance exercise (Gray et al., Cell Metabolism 2006; Haldar et al., PNAS 2012; Prosdocimo et al., JBC 2014). We and others have also shown that KLF15 itself is a direct target of key metabolic transcription factors such as the glucocorticoid receptor (GR), the circadian clock machinery (BMAL1) and cAMP response element binding protein (CREB). Recent studies from our laboratory have defined the GR-KLF15 regulated transcriptome and demonstrated that this physiological transcriptional circuit is critical for muscle adaptation. In addition, we have shown that the GR-KLF15 network also mediates therapeutic effects of corticosteroids in Duchenne muscular dystrophy (Morrison-Nozik et al., PNAS 2015). A major focus of the laboratory is to elucidate detailed molecular mechanisms of KLF15 function in metabolsim, as well as discover new signaling pathways critical for cardiometabolic homeostasis. The zinc finger transcription factor KLF15 (Kruppel-Like Factor 15) is an essential regulator of gene programs governing metabolic adaptation. KLF15 is robustly induced with fasting or endurance exercise. In skeletal muscle and liver, KLF15 regulates the physiological catabolism of branched chain amino acids (BCAAs) for their flux thru the hepatic gluconeogenesis. In addition, KLF15 regulates disposal of amino acid-derived nitrogen via the hepatic urea cycle. In addition to regulating gluconeogenesis, KLF15 promotes increased utilization of lipids in working striated muscle (skeletal muscle and heart), a measure that fuels ongoing muscle contraction while sparing glucose for the brain. KLF15 expression is under direct transcriptional control of key metabolic effectors, including the circadian clock machinery (CCM), the glucocorticoid receptor, and CREB.